OPEN FOR EASTER BREAK!!!!!! !FABULOUS, 3000 sq ft 3 story OCEANVIEW house one block to beach , 3 blocks to downtown.YOU WILL FALL IN LOVE WITH THE HOUSE AND LOCATION.!!! Two upper sun decks, front patio, covered outdoor eating area off kitchen, beautiful table seats 8, built in bbq, refrig and sink. Ocean white water views from master bedroom front patio and upper front deck. Awesome family house - master has kingsize bed, lg bath with jacuzzi tub, guest room has queen bed, own bath , and the large 'kid room' has 2 full size beds and a double futon couch- full bath with tub/shower.. Loft has daybed with trundle... All bedrooms have their own baths and closets.. 5 large new flat screen TVs and 4 blue rays, wireless high speed Internet thru out. All high quality linens, fully equipped kitchen, granite counter tops. Garage is full of fun beach stuff but has PARKING for 3 cars behind. 4 beach cruisers, 2 kid size bikes, 2 mountain bike, boogie boards, soft surf board!!! beach chairs , towels,umbrellas and 2 large beach carts.Just added beach stroller for little ones. We bought this house after looking for 2 years and just felt it was the right one for us. We are furnishing it for us and hope that you will fall in love with it just like we have and want to be return guests. We love to walk the short block to the sand and watch the sunset over Catalina island or take a bike ride either south to Newport Beach or north to Sunset Beach. Doggie beach is just a short walk down the boardwalk towards the cliffs and it is always fun to 'doggie' watch.. Lots always going on in HB! Check the surfcity website! !few minute walk to the incredible pier and main street and 2 short blocks on to the new Pacific City development - a real plus for the downtown vibe! We have been married 35 years and have 2 children 31 and 28. I grew up in Huntington Beach and it is a special place for our family. We love the house, the town, the beach and how close we are to all, but still on a quiet street. We put alot of TLC into making it a special place for ourselves and our family , friends and guests. I grew up on 12th st in HB and graduated HB High in 1971. Have a large family still here and look forward to sharing our beautiful new home with them for many years to come. Have a memorial bench on beach walk way at Goldenwest for parents.We love being so close to everything - !!! The new Pacific City development is also just a short walk away. - no hassle with parking at the beach, Pier, Main Street or Pacific City. Best value home for the LOCATION, QUALITY ,SIZE and PARKING.. A two minute walk to beach(signal bathroom,crosswalk), main street, the pier.NEW BEAUTIFUL CHILD PLAYGROUND one block away. Has an urban feel when sitting out on the front patio catching late afternoon sun , reading a book, having a glass of wine. . Walk everywhere.!!! If you are looking for a really nice upscale but comfortable, fully equipped home close to beach and town you won't be disappointed! We also have a safe in master closet for your valuables. Very well equipped for beach and daily living. (2) 2nd floor- new top of line on 2nd floor - High eff. 2nd one in garage for all the beach towels! (2) 2nd floor -high end brand new steamer - 2nd one in garage for all the beach towels! Love the house, we will definitely be looking to stay here again. Beats staying in hotels, make your self at home , cooking, going to beach, just a great place to stay.. The house was perfect for our party of 8! It is only 3 blocks from the beach and just a few blocks from Main street. You can walk to everything, shopping, restaurants and even CVS. We were pleasantly surprised to have beach views from the awesome outdoor patios! The house has everything you need and the beds were very comfortable. The owner, Donna, was so welcoming and helpful! She touched based in advance of our stay to make sure we had all the necessary info and was very responsive before and during our stay. Huntington Beach is our new favorite vacation spot! The views, the weather, the food, the people and the town were all so awesome! It has a laid back vibe and is very family friendly. We will definitely be back! Donna was a wonderful host. Very easy to communicate with and responds promptly to any questions you may have. The house was perfect for us. Although it was a little cold in February, we enjoyed the location so much - riding bikes, walking, the Farmers Market and watching surfers in the morning at the beach. We had our family (older young adult children) and our parents with us (8 of us in total), and everyone had a comfortable bed, plenty of bathrooms and a fully stocked and well equipped kitchen to enjoy family meals. We are definitely coming back! 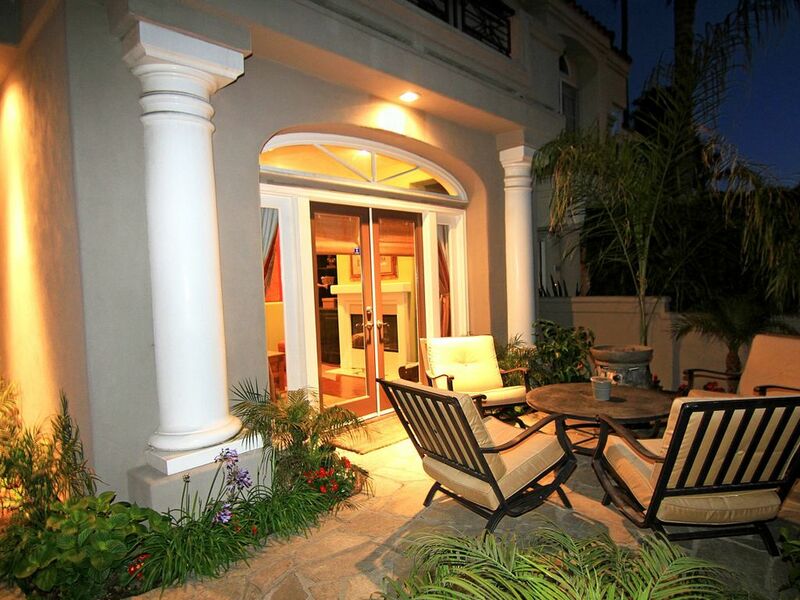 Great proximity to the beach, pier, restaurants and shops in Huntington Beach. The location was perfect and quiet. I wish we would have spent more time taking advantage of all that Huntington Beach has to offer instead of trying to go into LA. The house met all of our needs and was the perfect size for our extended family...everyone had their own space which was nice. We didn't get to take advantage of the outdoor spaces because the evenings were pretty cool and the cushions outside we in pretty bad shape. The garage was full of bikes and beach toys, but the combination key pad would not work. The only very minor complaint was the hot water took a while to get hot in the shower and it was scalding hot once it did. It wasn't a big deal once we figured it out. This is a great house for a large group looking for quick beach access and walking distance to coffee and restaurants. The beach playground was amazing for our 5 year old...we went every morning we were there. Donna, the owner, was great and responded right away every time. Our family loved it...thank you for a great stay! My extended family enjoyed the position close to beach and town, the bikes, the well stocked kitchen, the multiple bathrooms and TV’s. A very pleasant place to spend a family holiday. Exceptional property and amenities, close to beach, activities, shopping and dining. Donna was amazing with directions, help, details and everything else (airshow was awesome!). Highly recommended and hope to visit HB again soon! close to all that Huntington Beach 'surf city' has to offer All shopping within a few miles, trader joes, albertsons, target,, ralphs, home depot, the mall. Walk to main st, , starbucks, Sugar Shack, CVS, world famous pier 3 blocks, boardwalk, the strand , all right here.disneyland 30min, Hollywood 60 mins, legoland 80 mins, San Diego Zoo 2 hrs away, LAX 45 mins, Long Beach airport 25 mins A great place to go in any direction.